I like these buns because they make you feel healthy and happy. They taste so good and every bite you take is a little different from the next, because there’s so much going on with all the different ingredients. I usually make double the amount of this recipe. The buns keep well in the freezer and you can give them a quick ‘pick me up’ in the microwave. You need to prepare a so called ‘sweetener’ which gives the dough it’s distinctive and pleasant taste. For this you mix 40 grams of sugar with the zest of 1 unwaxed lemon and one unwaxed orange. You can store this mixture in your fridge, it will keep for a long time. You also have to wash and soak your raisins. First wash them and then leave them for 10 minutes in warm water. Rinse with cold water and leave to dry on a plate for two days (cover them against dust). If you do not want to wait two days, or you forgot, just drain them well and roll them lightly in flour before using. You also have to lightly toast the nuts, seeds and oats and leave them to cool before they go into the dough. Put them on a baking tray and toast them in your oven for about 12 to 15 minutes at 145 ºC /295 ºF. Make the dough with all the ingredients (except the muesli mix and raisins) and 200 grams of the water. Then gradually ad the rest of the water and knead the dough well. If you use a KitchenAid type mixer, mix for about 8 to 10 minutes. Make sure the dough is not too sticky or too dry. Aim for a bit tacky, which means that when you poke the dough with your dry finger it should stick for a second but then peel of as you remove your finger. Leave to rest for 5 minutes. Ideally the temperature of your dough after mixing should be around 24-25 ºC / 75 ºF. You should adjust the temperature of the water you add, so the total dough reaches this temperature. For us this means in summer adding cold water to this recipe and in winter adding warmer water (up to 50 ºC /122 ºF if needed). You can measure the temperature of water and dough with a food thermometer. These measurements are important because they correspond with the proving times in the recipe. 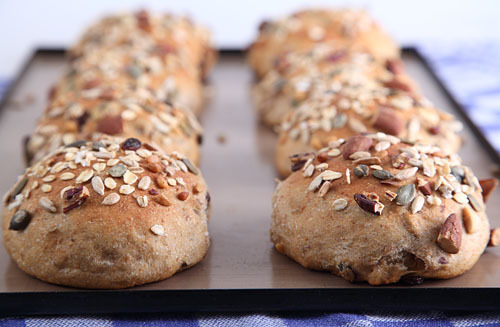 Then add the raisins and muesli mix (you can add the whole 150 g or add 100 g and use 50 g to cover the top of the buns like I did in the picture) and ‘pinch’ it through the dough very carefully by hand, so everything is evenly distributed. If you are lucky enough to own a spiral mixer, you can use that instead and it will only take one minute. If not, just do the hard work by hand. Press the dough down with both hands into a flat disc and roll it up, cover it and leave to rest for 15 minutes. Now divide the dough into equal parts of 90 grams and make buns. Again leave to rest for 15 minutes. Press the buns with your hand until slightly flat and round the dough again into smooth balls. Lightly moisten the top of the buns with water and press them into the muesli mix that you kept behind or in the optional oats or crushed wheat. Place the buns on a baking tray lined with a baking sheet (we use our reusable thin fiber baking mats) and cover with floured plastic wrap. Preheat your oven to 210 ºC /410 ºF. The rolls are ready for their final proofing. Now wait til the buns are proofed to perfection, depending on your room temperature this should take at least 1 hour, but more likely 1.5 hours. Just be patient and check regularly. A good method to see if your buns are ready is very gently poking your fingertip in your dough. When ready place the buns in the oven and bake for about 25 minutes, depending on your oven. They should have a nice golden brown shine. Leave to cool slightly on a wire rack and eat one while still warm! They also keep very well in the freezer too. Lovely buns, they taste delicious! I was just wondering: should you use all 280 grams of water? I did, but my dough was very, very wet. Even wetter than a focaccia dough. Maybe something went wrong with the weighing. Because I’m an experienced bread baker, I did get it right by adding flour gradually until the dough was workable, but I’m not sure what went wrong. Maybe I made a mistake while weighing the ingredients. Is it something you recognize, or have heard of from others? I used my favorite biodynamically grown wheat flour from the wholefood store. Maybe I’ll try again in future, but there are so many delicious recipes on your website to bake, that it will take a while, I’m afraid ;-). Hard for us to judge if you by accident made a measuring mistake. If we stick to the recipe with our flour and ingredients, we do not get a very wet dough, just slightly sticky. In the recipe we describe what type of stickiness you should aim for and how the dough should feel. So that is why we also advice to first add 200 g of water and then gradually add more. Of course you can add less water, because it also very much depends on the flour you use and how the liquid is absorbed by it, how much is right in your case. So always use your experienced eye to judge and adapt if needed. Hope you will try some more recipes of ours. Enjoy your baking and sharing! Another great recipe! Thank you both. They not only taste delicious (reminiscent of hot crossed buns), but the smell is pure heaven. I really love the addition of the orange-lemon zest & sugar mixture, that adds a professional touch. I did add 1 tablespoon of vital wheat gluten to give it a little extra push. I topped with extra muesli before I let them rise, but the topping burned. I will use simple oats next time and give the burned topping I picked off to the deer standing outside my kitchen door, lured by the smell of baking buns and hoping I will share. Thank you so much for your lovey feedback. Adding the wheat gluten to get that extra push can give great results. Sorry the topping burned, maybe you can try to temper the oven after the buns and topping have reached the right browning and maybe if possible place the tray on a lower tier. Baked these today, turned out great. The flavour is delicious and they rose as they should. Made them 100g each, a tad bigger. In the recipe it might be helpful to mention to heat the water to about 120F before adding it to the mix. Thanks for a great recipe, definately will make them again. Thank you Dietrich, will do so! Glad you like the recipe. My buns came out quite small. I can’t tell from your picture what size they should be. Mine did rise but not doubled in size. “Double in size’ is not a very good indicator, you really need to use the poking test we describe in the recipe. Take your time, as much as needed, aim for the buns to be around 8 to 10 cm in diameter, the structure should be easy to bite into, the buns are firm, but not compact. I’ve never tried Muesli buns. The picture of them looks tasty and it’s a plus since they’re healthy. I love when I can find a healthy recipe to try out. Is there a conversion to this recipe that is not metric? Ik heb deze mueslibroodjes van de week gemaakt en ze waren echt heerlijk! De volgende keere moet ik z iets minder hard bakken, ik moet namelijk nog wel even wennen aan mijn nieuwe oven. En ook de temperatuur van het deeg was iets laag, waardoor het rijzen niet zo vlot verliep. Maar al met al een prima resultaat. Zo leuk om van je te horen! Fijn dat de mueslibroodjes al zo goed gelukt zijn. Volgende keer een beetje ‘finetunen’ en dan zijn ze wellicht perfect zoals je ze hebben wilt. Misschien is er een vervelende bacterie in je desem terechtgekomen, die kan soms ook in het meel zelf zitten. Kan gebeuren. Gelukkig heb je onze desem nog, hopelijk gaat ie nog een hele tijd door :).